Every company makes mistakes. Coors once tried to sell spring water. Google released those terrifying glasses. For Theranos, its mistake was creating a disruptive, game-changing, totally nonfunctional blood-testing technology and then using it to distribute tens of thousands of inaccurate tests over a two-year period. According to The Wall Street Journal, the onetime Silicon Valley darling has voided all results from its signature Edison blood-testing devices from 2014 and 2015 and sent tens of thousands of corrected reports to doctors and patients throughout the country. The Edison machine was the reason for Theranos’s $9 billion valuation — it was supposed to be a blood-testing device so exquisitely fine-tuned it could make accurate diagnostic testing with a pinprick of the red stuff, making preemptive blood testing cheap and anxiety-free. But since the Journal exposed its faulty results in October 2015, Edison has produced nothing but anxiety for the company and its consumers. The wave of corrected reports comes as Theranos is trying to convince regulators not to ban it from the blood business. 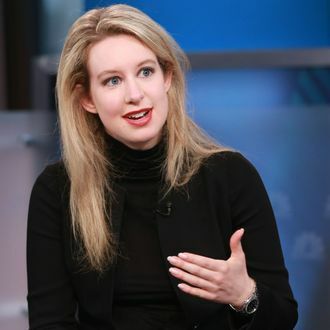 In March, the Centers for Medicare and Medicaid Services found that the company’s lab in Newark, California, posed “immediate jeopardy to patient safety.” The agency threatened Theranos with stiff sanctions and contemplated suspending the company’s charismatic founder (and world’s youngest self-made female billionaire) Elizabeth Holmes from the blood-testing industry for two years. The company’s decision to take full ownership of its errors is a welcome change — when the Journal’s exposé hit newsstands (or Facebook feeds) last fall, Holmes derided the “disgruntled former employees” who had spoken with the paper. But in taking responsibility for Edison’s failures, Theranos has also revealed the astounding scale of its shortcomings. Thank God doctors always wait at least two years after receiving blood-test results before making any important medical decisions.